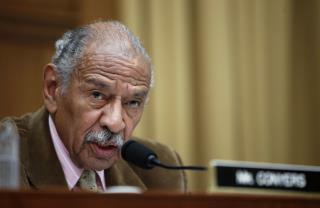 (Newser) – Michigan Rep. John Conyers confirms that he did indeed pay a settlement to a woman who accused him of sexual misconduct, though he continues to deny the allegations. "My office resolved the allegations—with an express denial of liability—in order to save all involved from the rigors of protracted litigation," said Conyers in a statement, per NPR. "That should not be lost in the narrative." Conyers, who "vehemently" denied the allegations, also promised to cooperate with any congressional investigation that ensues. The statement came hours after the AP reported that the Democratic congressman had denied paying any such settlement. What about all the other creepy stuff this wrinkled old -uck did? Not sure why republicans wanna go down this road. If they start investigating democrats for alleged sexual misdeeds, it inevitably means they must investigate trump for the same thing. The allegations against trump are far worse than anything Mr. Conyers is accused of.